La Cucina is our school canteen and catering facility located on the Ground Floor of the Anthony Building. 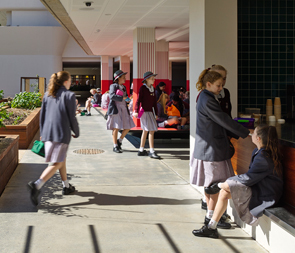 It is a modern purpose-built facility providing healthy, fresh meals for students, staff and visitors to the College. Seating is provided adjacent to our Home Economics kitchens overlooking our beautiful kitchen garden. La Cucina is an important service provided to students and staff and visitors. 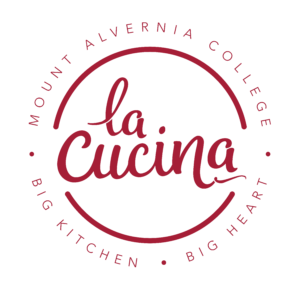 The College employs staff to run the day-to-day operations of La Cucina, but relies heavily on the generosity and support of the Mount Alvernia College community. Parents/caregivers volunteer their time to help, and we are always looking for more people who can give up a few hours once a month to keep this vital service operating. Please note that La Cucina is open for breakfast, morning tea and lunch. (7.30am-3.30pm Monday to Thursday, 7.30am-3.00pm Friday). La Cucina is a cash-free facility. Students and staff utilise the facility of their identification cards, to which funds may be uploaded either on-line or at the on-campus kiosk. Students can avoid queues by pre-ordering their lunch and enjoying priority service at La Cucina during the lunch break.